There is a staggering amount of mail theft in the US every year. In the last few years, there has been an average of 10,000 arrests for possession of stolen mail or mail theft. One way to reduce or eliminate the possibility of mail theft is to move the mailbox close to the house. Mailboxes that attach directly to the house are less likely to be the target of vandalism and theft. Another benefit of a wall mount mailbox is convenience. You can now fetch your mail at any time without leaving the comfort of your home. Just step out and onto your porch, and you can get your mail. It is true far more convenient than a neighborhood collection box or the multi-mount mailbox. Although it is a little more inconvenient for the postal service. 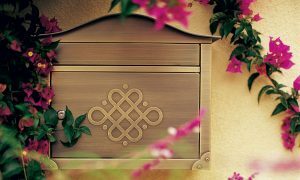 Wall mount mailboxes also add an element of style and uniqueness to your home. The look and feel of these mailboxes evoke the retro small-town American feel. Wall mounts are customizable and come in a variety of sizes, colors, materials, and shapes. Written by California Mailboxes. For an extensive selection of brass mailboxes and others see the collection available at California Mailboxes.